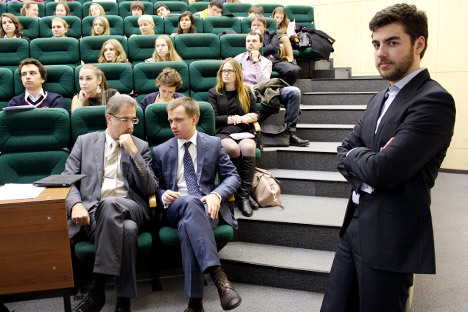 Maxim Godzi, director of the InCube business incubator under the Russian Presidential Academy of National Economy and Public Administration. Source: PressPhoto. The InCube business incubator Director debunks the top three misconceptions foreign investors have about starting a business in Russia. The majority of Russian venture funds are less than five years old, so there are no investment campaign user manuals like those found in the US or Europe yet. As a result, investors that try to apply American or European concepts in Russia make the same kind of typical mistakes. On the basis of our experience of working with foreign investors, we have compiled a list of the most widespread misconceptions: What works abroad but not in Russia. The startup fad coupled with private capital accumulation has led to emergence of a lot of angel investors and various venture funds, from consulting companies to IT corporations. More than 50 such funds sprang up in Russia in 2012 alone. The funds’ desire to attract new players as quickly as possible has resulted in an abundance of half-baked, deficient startups. Typical examples include yet another social network devised by college students or graduates to get on the popular bandwagon. Russia’s startup community has been mixed with popular youth trends, such as hipsters, and also with politicised youth movements (Seliger, the ‘You Are an Entrepreneur” project, or the Zvorykin project). Many of those guys do not need investments that require responsibility or the need for hard work. At the same time, key “idea holders” (researchers, engineers, university graduates) are not even thinking about starting up companies -- even if they have innovation ideas of their own. So the situation is as follows: the market is teeming with all sorts of investors whose capital is mostly spent to pay their own staff – managing partners and analysts. There are more shovel sellers than gold diggers. To sum up, the shortage of actual projects is so acute that inventors occasionally put up with things international startup projects cannot hope for in their wildest dreams. For example, I have witnessed an official $100,000 angel investment in a project that lacked even a basic financial plan. What is that if not an investment out of desperation? This works for the US and Europe, because of the acute shortage of hi-tech ideas there. Of course, there are more there in absolute terms than in Russia, but there is constant competition, too. Any high-potential idea is quickly seized upon by a well-developed infrastructure of startups and entire funds and turns into a venture project. Accordingly, the investor’s task is to beat others to such a project. The situation in Russia is somewhat different. Over the last 30 years or so, research institutes and universities have been accumulating ideas that could have become successful venture projects but failed to move in that direction (Despite all the efforts by Soros and federal foundations responsible for supporting innovation in Russia). The accumulated ideas could still become innovative products but their authors possess little culture of doing business in the early stages. The success ratio of preseed investments in Russia is extremely low. This suggests that the idea that investing early is good for you is wrong. In Russia, money can buy solutions to many more problems than elsewhere. Despite what anyone might have been led to believe, this is now a country with a pervasive market economy and a high degree of deal-making freedom, with little government regulation. Why would it be wrong, then, to expect a project to be scaled quickly to match the investment? The Russian mentality and, more importantly, the environment for interaction with government bodies, suppliers, and customers affect business activity. Market players end up being much more passive than is generally believed. For instance, Russian companies providing pre-investment advisory services point to delays between the signing of an agreement between company founders and investors and receipt by the company of real cash as a key passivity indicator. In Russia, the delay might be anywhere from six months to a year. Similar delays will dog the project down the road, through its every stage. Foreign businesspeople cannot get their heads around some Russia-specific challenges, such as why, even after all the simplifications, incorporating a company takes at least two weeks, including opening bank accounts and notifying social security funds. Many projects are finding it difficult even to estimate on their own the amount of money they need for development. They often go to the extremes, leaving an entire business area ignored, the result being improbable estimates of amounts needed for initial development. In InCube’s experience, it is not the amount of the investment but the accompanying participation by the investor in running the company’s business that has the most serious impact on startup growth and scaling. A project’s internal deficiencies can be offset or remedied by expertise and advice from an investor who does not just leave the project to its own devices. All the above challenges being taken into account open up attractive opportunities for foreign partners on Russia’s venture market. Those niches include skilled pre-investment advisory, independent project examination and deal support. More than their foreign peers, Russian startups need smart money, professionally drafted investment use terms and conditions and direct participation by the foreign investor or co-investor contributing their expertise and connections to the project’s success. Language or cultural barriers are no obstacle to realistic startups that can appreciate an investor’s contribution by delivering their best performance. Many of Russia’s best startups travel to Singapore or Silicon Valley to compete there successfully with the best projects the world has to offer. If you would like to invest at an early stage and shape a project to your liking, ignore large-scale startup events and visit student and young scientist conferences instead, or look for projects online. Persuasive projects can be found on new Russian crowdfunding websites and specialised blogs where active projects share problems and solutions. If you run a startup in Silicon Valley or you have invested in such a startup and now you cannot find a co-investor at home, you will be welcome in Russia. It offers not only strong demand for startup projects and cheap services from freelance software developers but also a strong desire for cultural exchange, synergy and mutual enrichment within the startup community. Maxim Godzi is a director of the InCube business incubator under the Russian Presidential Academy of National Economy and Public Administration.